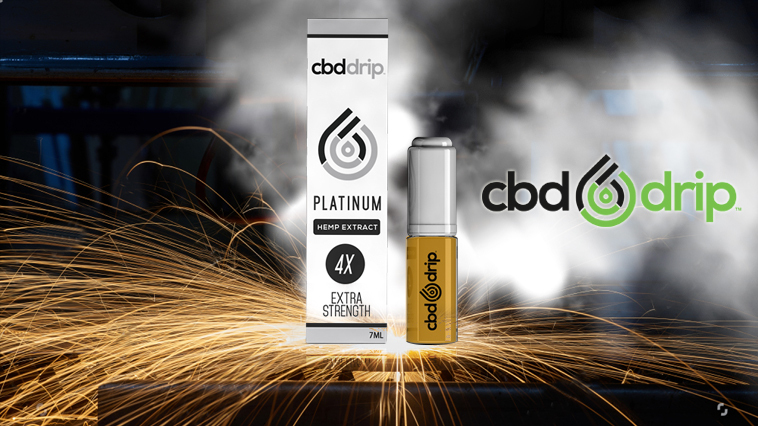 We took CBD Drip's platinum for a spin -- and it didn't disappoint! If you’ve been thinking about trying CBD, and haven’t experienced a clean, full spectrum cannabinoid product, CBD Drip Platinum is a great option. And best of all, it’s optimized for mixing with your favorite e-juice flavors! Very classy branding. The text on the outside of the CBD Drip box was easy to read, and the color palate carried over onto the bottle itself. This was my first time trying any CBD/hemp based product, so I apologize ahead of time for any inaccuracies in my “feel” description to follow. Platinum was odorless for me. This product is also specifically designed to be mixed into your favorite e-juice (what I did). They did however, state that some users drip the product directly onto their tongue. I noticed a slight bitterness associated with the platinum CBD. It was no more potent than the Gold bottle of CBD drip I reviewed previously, and did not diminish the overall product appeal. I decided to drip platinum for this review. I had a set of 3mm (ID) aliens on the deck of the Wotofo Warrior 25mm BF RDA. My airflow was shutdown 50% in hopes of finding any flavor inconsistencies associated with the product. 6 drops in 5ml of 70/30 in a frosted doughnut in strawberry milk flavored juice from The One E-liquid. I mixed the two products in a small 20ml needle nose bottle, with ml markings on the side for accurate measurement. Before: Jittery as normal. Just had a small cup of coffee (gotta have that afternoon kick! ), and ate a handful of mixed nuts (lunch 2hr prior, definitely full at this point). During: I dripped my CBD mix for a good hour, while finishing the last few sips of my coffee. During this time, the jitters remained, and I’m sure the coffee did not help. I actually worked on straightening a few things, and played darts while waiting for the full effects to kick in. Dripping my strawberry frosted cereal CBD mix did pay off, as I was able to pick up on some light bitterness associated with the oil; it wasn’t enough to drastically alter the taste of my e-juice, but was worth noting. Only after vaping 1 – 1.5ml of the CBD e-juice did I start to notice the effects of the product. For me, it was someone adjusting a little ‘go’ wheel for my body. I’m a go-getter for sure, and constantly trying to fit in as much as I can throughout the day. The CBD helped to slow the constant bombardment of thoughts down ever so slightly, and allowed my to focus freely on the task at hand. I noticed some clamminess on my fingertips as well. After: Calm. That’s the first word that comes to mind for me. My jitters reduced significantly. My internal ‘noise’ level seemed to quiet down a bit as well. It’s actually rather interesting, especially considering CBD oil contains almost no THC, and is not associated with any psychoactive effects. The after effects are quite difficult to put into words. But, I did experience an uptick in mental clarity without a doubt. It was easier to concentrate, and really seemed to do the trick. Platinum was a big step up from the Gold version of CBD drip, and it seemed to be the right potency for my body weight. A used a 70/30 blend to mix Platinum. So, no cloud chasing here. I chose the thinner blend because I felt like it would mix better with the product.